The original Zippin Pippin made its debut in the early 1900’s under the name of Pippin at East End Park located in Memphis, Tennessee. During these early years the ride was a favorite of Elvis Presley. At times he would rent out the whole park just to be able to ride Pippin without having to worry about his fans flocking around him and without having to wait at all. As the 1970’s rolled around the city of Memphis decided to take a leap and began making plans to build an amusement park around Pippin and a nearby carousel. In 1976 this plan became reality as the city of Memphis opened up Libertyland. Along with the opening of the park, Pippin was renamed Zippin Pippin. All was well for Zippin Pippin and Libertyland until 2005 when the park was forced to close due to diminishing profits. Unfortunately, the closing of Libertyland also ultimately spelled out the end of the original Zippin Pippin. As the park closed the ride was no longer properly maintained and it began falling into disrepair. In 2009 the ride began being dismantled, saving as much as possible. However, much of the structure was determined to be un-salvageable. In 2010 a new life appeared for Zippin Pippin. 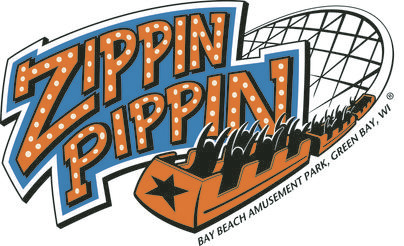 In March of 2010 the Green Bay City Council approved the purchase of the name, history, and design of Zippin Pippin. On August 25, 2010 the groundbreaking for the revival of Zippin Pippin in Green Bay occurred. Since a majority of the ride was un-salvageable the ride was rebuilt by the Gravity Group utilizing the trains and many mechanical parts from the former Thunder Eagle from Race World in Tennessee. The historic Zippin Pippin begins with a trip up the seventy foot tall lift hill. Upon cresting the lift the train slides through a gentle right hand turn before getting down to business and hurdling down its seventy foot drop. Upon reaching the ground the train quickly climbs right back up a hill and goes through another wide right turn. After this turn the train dives back towards the ground again and soars through three airtime hills before reaching another elevated right hand turn. Another drop towards the ground follows this turn. After the drop the train goes into an airtime hill with a left turn at the top that leaves it heading back parallel to the earlier set of airtime hills. Two more airtime hills, a slight left turn, and a rise up into the final brake run finish out the guest’s ride on the historic Zippin Pippin.